I needed a spray attachment for my kitchen sink and I do not have a mounted spray unit. This device attaches instantly and does not leak. The hose is flexible and the length is ideal. I use it for washing small pets! A utility sink would be more suitable but I can't use something I don't have. The hose attachment allows the pet to be quickly wetted, washed, and rinsed and then I can disinfect the entire work area. I was unable to find a similar unit at any local hardware or do-it center. Thank you. I bought this to replace another,which had just worn out. This one was easy to install and the rubber hose is very flexibile, which makes it easier to manouver. It is a simple, yet effictive design. Mo plummer needed. Didn't think it would really work...but it did. Makes washing my Mom's hair in the sink so much easier. Glad I took a chance. this is a great product for washing my small dog in the sink. This product functions well in the sink in my garage. I had one for years and had a difficult time finding another till I found Walter Drake website. It is easy to install and helps me bathe my dog. It helps clean up after painting or planting veggies. Super product with a million uses!! Oh so convenient. Easy to wash my hair in the sink now! It is very hard for me to bend over my sink to wash my hair. Now I can very easily! Have been looking for a sink spray hose for ages. This fits my faucet snugly and works very well. It's good quality but it doesn't fit the sink I hoped to use it on. Instead I'll use it on my kitchen sink with a standard faucet, smaller than the bathroom one. we use it in the kitchen sink to help wash my husbands hair. I love the flexibility of and the way it sprays very nicely. Needed one to push on the faucet. I bathe my dogs in the utility sink. was just what I searched for . Had tried to find one for years. Before I had this hose attachment for my kitchen sink, my hairdresser would have to fill a bowl with water and pour it over my head. The water went every-which-way. This was repeated until my hair was washed properly. My shirt would be drenched. Now, with this new convenience, The water is close to my head and controlled. I ordered iteven though there were many reviews that didn't like it. I use it to bathe my little dogs. I needed a small hose that I could use to rinse my dogs muzzle without making them feel like they were drowning. I rinse the connecter in hot water to attach to my small faucet and took off the sprayer attachment. I can clean their face much easier now. It was a fight before without this hose. My faucet is very narrow and I still soften the end with hot water to put it on and off the faucet. I am very happy with it for my purposes. When my mother stated that her arms did not work the way they use to and wanted me to come over to help wash her hair I immediately went on line to find her a sprayer. I checked all the major chains and did not fine what she needed. It was suggested that I try Walter Drake for they had everything and the prices were right. I did and had it shiped to her without her knowledge when it arrived I just told her to check it out and then let me know. I have been using these for over 16 years and they help when you have a sore back bending over the sink while this solves the back ache issues. I'm still using this YEARS later! three little dogs and a utility sink; this handy device makes bathtime quick and efficient. This sprayer has been used weekly; it attaches easily, but keep the water pressure down or it will spray at the attachment! I save $22 each time I wash my Peek-A-Poo in the double kitchen sink. Works GREAT, looks good and my little Jingle "Belle" loves the calm spray. It has an inner lip. Make sure you push it up ALL the way on to the faucet. You will have NO problems. Well worth the money. How did I live without this hose? I use this hose for everything! I wash my hair, I water my plants, I spray down flower pots. It is just so handy to have that extra reach of hose in the kitchen. I even pre-rinse dishes in the dishwasher before I run a load. Works good for bathing my dog in kitchen sink but a little hard to get on faucet and comes off sometimes. I took the sink hose spray with me to India and it fits all the new taps we installed beautifully. I just couldn't find one that would fit in BOmbay, so glad I found this here. Will be ordering more, to dismantle and fit longer hose lengths so I can then use for different purposes at home. I gave it a 4 only because I wish it came in longer lengths. This product didn't fit in my bathroom, but I can use it in the kitchen. My rental house does not have a built in sprayer. 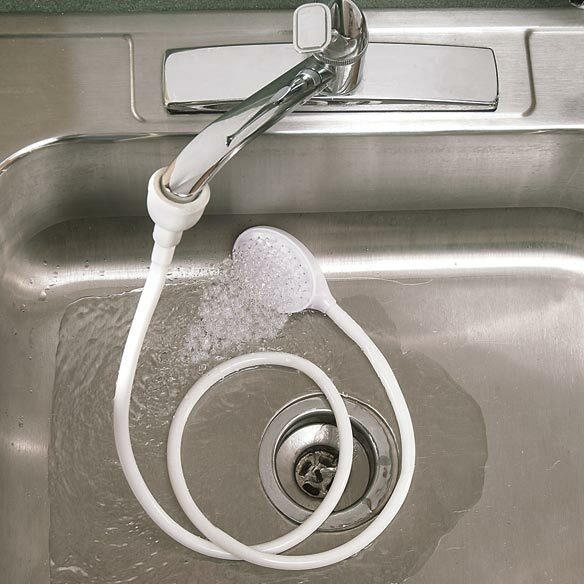 This push on sprayer is useful for rinsing pots and pans and cleaning the sink. We couldn't get it to fit on our Delta facuet so had to return. Bought this to use on our garage laundry tub faucet for rinsing off the dogs before they come into the house. As long as you don't use any water pressure, it's fine. If you kick up the water pressure at all, it pops off. Will eventually need to get something else. I was desperately looking for a add-on hose sprayer for my utility sink in the laundry room. I bought a much more expensive unit at the local hardware store and got it home and couldn't get it to screw on with my existing spigot. So I waited for a plumber to take a look at it and his deduction wass that it just wouldn't work. He was uncertain if I could find what I was looking for without changing the entire spigot. So when I saw this for the price, I was grateful to get it and just shove the hose on and have water come out without any leaks or screwy sprays. It's great for cleaning trash cans and other deep canisters. The item was received in the time specified and appeared quite sturdy. However, while I had no trouble attaching it to my faucet, it falls off as soon as the tap was turned on. I had purchased two (one for a friend) and my friend also had the same problem. Alas, I had disposed of the order form and other relevant info and so could not return it. No, I would not buy this item again. Bought it to use on my kitchen faucet. It would not fit at all. I'm returning or get a refund which I can't for purpose. Had one of these for 20+ years and it finally disintegrated. Was thrilled to finally find another one. Was not happy that it initially leaked.. had a hole in it. So I began with this one with duck tape around it to keep that water from spraying me while I washed the dog. It just did not fit a small utility room faucet which is what I was looking for. It does however fit a kitchen faucet and I will use it there if need be but actually was looking for one that would stay on the smaller (thinner I guess) faucet. This one just slipped off every time. 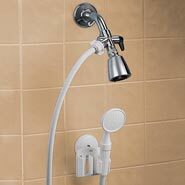 I live in senior housing; the bathroom shower which is a hand held unit will be replaced by one that I can reach and preferably use like a regular shower. Between showers I wash my hair in the kitchen sink but the faucet is so low, I bought the spray hose to help but it is not flexible and made it difficult to use. One I have not opened, the other will not be used again. A new faucet will be installed for me. put it on the fauset the 1st time and the srayer head seperated at the seam. I bought this to rinse my newly-colored haur but the nozzle does not fit mouth of faucet. Cheap, doesn't fit, cant get the sprayer on to the hose--so in the trash it goes. waste of money - cheaply made! the product is a cheaply made useless product - don't waste your money on this will not fit any faucet, hose is too short and if you drop the thing it might break! It went into the garbage! Because of the bad fit, this flimsy sprayer can't be used at all. I would return it, but the postage would eat up most of the refund and it's not worth wasting my time. Do not buy. It leak and I got wet. Water went up in the air, the hose came a part, the sprayer leak at the seam. Made cheap. I order 5 of them. All 5 have a problem. Sending them back. At first glance I knew it would not fit and it didn't. I had several people look at it they all wondered how this would fit, the hole was not big enough to fit any faucet. I am sending it back. This doesn't fit any faucet in my house or my neighbors. Was abe to put it on the faucet in my laundry room and as soon as the water is turned on it came off and wet everything!!! I tried this on several faucets. (3) And it would not stay on. And the hose is stiff, which made it difficult to manuver. the item I received stated it was for a water pipe, not a sink, would not fit on faucet, very small. This device was intended to easily slide onto and grip a faucet. I needed something like this as I had recently moved into a new APT. But found there is no spray nozzle built into my sink. So, when I saw this I thought it would be a great tool to use when cleaning the sink, etc. In short, it does NOT easily slide onto a faucet, as a matter of fact, it didn't fit my faucet at all. So, know this before you purchase this item. Not easy to use, does nothing " easily " and will not fit all kitchen sink faucets. The hose won't stay connected to the faucet and allows water to spray backward toward the wall through the supposed seal. i'm giving this away in hopes it will work better for someone else. the hose itself is thin and kinks easily. the part that attaches to my spigot, doesn't. just falls right off. totally useless to me. They should re-design it to be universal for all sinks. This product was a waste of money. It did not fit my faucet. Even when I held it on with one hand (so I could use the other to direct the spray), it continually fell off. DO NOT BUY!!! "Turn Any Faucet Into a Shower!" This is not a true statement. Does not work on all sink faucets. I did buy the one for kitchen sinks. My American Standard faucet is about 1 1/8 inch in diameter -- too wide for this sprayer. It probably would work for a faucet up to an inch in diameter. The rubber part of the hose did not fit on a standard sink facet. I got it for my parents.My dad washes my moms hair in the sink. We were all very disappointed with this product. It is advertised to fit "any"faucet,wrong!i have a standard kitchen sink faucet,it does not fit. WILL NOT GO ON FAUCET! Was hoping to use this for my Mom to make washing her hair less stressful but it doesn't fit on any of my faucets. Need a simple device to wash my hair. My old one finally wore out. I wanted something to make it easier to fill a large humidifier. This looks easier than repeatedly filling a bucket. To wash a person's hair. This will make it easier to wash my mother's hair. Couldn't find it anywhere else. Need to have for my elderly mother. Helpful to use to wash my dog. Haven't been able to find one in stores. Need for dishwashing since I hand wash and spray hose leakes. Convenience if hose fits sink spout.. I think that it's handy for wash cleaning patio. My husband is crippled, this item will help in bathing and cleaning. Thank you! Not currently able to take shower. Need something to wash hair in kitchen sink but not tall enough. I'm only short on one end though! Haha! Need extra hose for washing pets. I am in an electric wheelchair stemming from an auto accident with a semi hitting me head on! I cannot transfer nor stand any longer and getting my hair washed is next to impossible due to my chairs back being too high to recline adequately back to the sink. I am hoping this cap will solve this problem for me. I am excited to get it and try it out. For rinsing dishes and hair. The only place i could find this item. To wash my moms hair, so she won’t have to bend over sink. She can be comfortable sitting and bending her head backwards and to wash new puppy. Oh, yes, I have been looking for one of these hoses since my grandma had one in the 1970’s! I have and dog and no utility sink. This hose will, hopefully, make her baths easier. comes in handy to wash my hair,then rince it with the hose. hard to find the lenth. Have been looking for one. I needed a sprayer for our sink but could only find one for the tub. Will it fit snugly on a 13/16ths aerator? BEST ANSWER: Thank you for your question. The part that attaches to the sink is 1 inch in diameter. We hope this information will be of help to you. can this be used on a tub faucet? BEST ANSWER: Thank you for your question. As a tub faucet us usually bigger than a sink, this would not work on a tub. We hope this information will be of help to you. no/ bath tub faucet is usually more oval in my experience. how many stars this have? BEST ANSWER: i give this sink hose the highest star possible i have had my hose for approximately 2+ yrs. i just love it...i do recomend this hose. thanks easy comforts! Is there a button on the hose? BEST ANSWER: There is no button. U turn the water on/off on the spigot! It is convenient for me, I sit and wash my hair at my sink. I am a handicapped person. This hose allows me to do my own hair color. how does the hose connect to the faucet? Does it simply push up with no hardware involved? BEST ANSWER: Yes, the sprayer is pushed up over the faucet without any hardware. Yes it just pushes up onto the faucet, there is no hardware. Can this be attached to an outdoor hose? BEST ANSWER: only with low water pressure. Higher water pressure would blow it right off. I threw this product in the trash because it did not fit any of my faucets. Need same with longer hose at least 60" ? BEST ANSWER: Thank you for your question. This is the only size we sell. We hope this information will be of help to you.